At Peter Island there are a variety of rooms to choose from - Ocean View rooms, BeachFront Junior Suites, and there are also luxury villas for rental. Please see menu above for detailed description of all room types. Peter Island is located in the British Virgin Isles in the Caribbean. 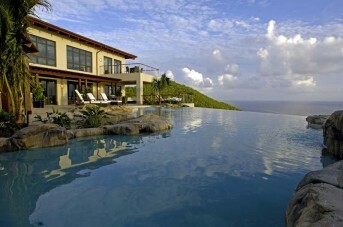 Peter Island is just five miles south of Tortola and is served by ferry, helicopter and their private yacht. You can fly into Beef Island Airport, Tortola (EIS) via San Juan (SJU), St. Thomas (STT), Antiqua (ANU), or St. Maarten (SXM), then transfer to Peter Island via the private yacht. Transfers from Beef Island Airport are complimentary to our guests. The most direct way to fly to the BVI from North America is via San Juan, Puerto Rico (SJU). Guests visiting from Europe can fly nonstop direct to Antigua daily on major carriers. Frequent connecting service is offered by American Eagle, Liat, Caribbean Sun and Cape Air, with occasional service by other airlines and charter flights. The Beef Island Airport has daily service from San Juan. Helicopter service is available from St. Thomas or San Juan and will land on the island's private heliport. Peter Island now also has it's own ferry to meet guests flying into St Thomas. The ferry operates on Tuesdays and Saturdays and takes 1.5 hours including customs clearance. Peter Island Resort is a luxury British Virgin Island retreat in the Caribbean, waiting to surround you in luxury, peace and beauty. The island is a true Caribbean paradise that offers a day spa, and many other activities to excite you on your luxury holiday. On top of this, the staff offer highly attentive yet unobtrusive personal service. Peter Island is surrounded by the Atlantic Ocean, Caribbean Sea, Drake's Channel, six breathtaking bays, and 20 secluded coves. Located four miles south of Tortola, it is the fifth largest of the loose array of 60 islands, cays and exposed reefs that comprise the British Virgin Islands. The main resort complex is situated on the north and east side of our vast island which has 1,800 acres of lush mountainous terrain, miles of hiking trails, and five gorgeous white sand beaches. The island’s largest and most beautiful beach is Deadman’s Bay – here there are protected waters for wind surfing, swimming, snorkeling, sailing and other watersports. Close by are tennis courts, watersports pavilion, and a Fitness Centre. Also located here is the Beach Bar and Grill, and the Beach Front Suites are nestled into colorful gardens at the west end of the crescent shaped bay. Honeymoon, the resort's most intimate beach near Cabey Point, offers only two lounge chairs beneath a single thatched hut. Island tradition dictates that lovers pay tribute to the beach at least once during their stay -- one couple at a time, of course! Another beautiful bay at Peter Island is Big Reef Bay which is a short walk over the hill side from Deadman’s Bay. This bay sets the perfect setting for romantic sunset walks, and the resort’s fitness trail winds along this beach as well. White Bay's Beach is favored for its privacy and breathtaking views of Norman and St. John Islands. Snorkeling on either side of the bay, where fish literally eat out of extended hands, is the best on the island. Its sparkling white sands are a perfect place to enjoy an exquisite picnic lunch. A 3.4 mile round-trip walk or complementary van ride from the marina and reception area provides outstanding vistas along the way. Prices quoted for Peter Island include a Full American Plan (breakfasts, lunches, afternoon refreshments and dinner prepared by expert culinary team). All rates are subject to a 17% tax and service charge, and minimum length of stay requirements. At Peter Island resort there are plenty of beaches and secluded coves if privacy and relaxation is what you are seeking. Otherwise, for the more active there is snorkelling, diving, sailing, sport fishing, or excursions to St Thomas for a day out shopping.